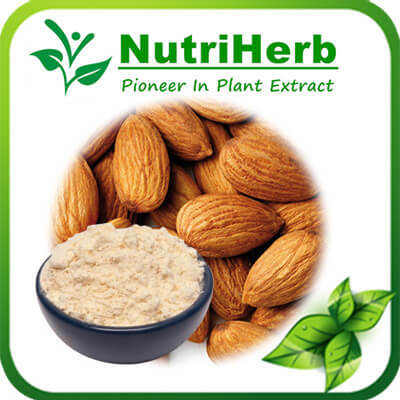 Almond powder is rich in fiber, phosphorus, iron, calcium, vitamin B17 and unsaturated fatty acids and other important nutrients. Used for nourishing heart and lung, can cure the virtual cough asthma, intestinal dry constipation embolism. 1,The bitter apricot kernels can relieve a cough, relax bowel, cure for tuberculosis, sough, lung disease and so on. 2,Sweet almond and fruit big almond that we eat daily leans to moist, have certain fill lung function. 3,Almond also contains rich flavonoids and polyphenols composition,this kind of composition can not only reduced human cholesterol, still can significantly reduce heart disease and many chronic disease onset of danger. 4,Almond also have hairdressing effect, can promote skin microcirculation, make the skin ruddy luster. Infant food, health food products, dairy products, seasoning food, solid drink, convenient porridge series, chocolate, the baked food (bread, cake, cookies), other edible products. Amygdalin also can be used as dietary supplement and food additive to control weight.